One of the mammoth sunflowers is trying to open up. I am super excited about how big and beautiful these flowers are going to be. We have had a very hot spring and even hotter summer. I know we have had some afternoon down pours. However, the real credit to the success of these flowers goes to the hubby who waters them twice daily. They add something lovely to the chain link fence. This is one of the lovely crape myrtle trees in my yard. Even thought the little pink flowers are all over my path and car I still love it. So pretty! I do have to say that it seems a bit early for the blooms. I love our little home, too bad its not ours. Hubby and I decided to take an trip to the newly renovated state art museum here in Raleigh. NCMA. It was fairly crowded, which we expected. I was so pleased that after all of the expansive construction that it under went, it remains free to the public, like most of the all the other Raleigh museums. They maintained and added to the sculpture garden/ park and the amphitheater that remember as a kid. My husband really wanted to go for our anniversary which is next week, however, we are working super opposite schedules. Today was prime because it is scorching hot here. The new gallery is stunning and inviting with a lovely restaurant. White roman shades plus white shears cover large walls of floor to ceiling tinted windows. There are lovely gardens filled with water features and Japanese rock gardens behind all of the windows. White domed skylights bathe the entire space. It was simply calming and peaceful even though there were many people. They have permanent exhibitions that I also remembered, I was pleased to see Rodin castings. The only draw back was the gift shop, the art items for sale were modern and not made by NC artist. We will be returning soon. I woke up and decided that I wanted to hang out with the dog. I think that she had a different idea, she got pretty muddy in the back yard, she was very proud of herself. She has taken a liking to digging holes when no one is watching. She stayed in with me in the ac while the storms passed. We had some pretty threatening thunder storms today. I worked on getting some baby gifts completed, my two step-sisters are pregnant. I am going to see them soon at the lake. I had done the machine sewing a while ago for all three. The pieces went to the beach with us and have rode around in the back of my car for a whole week. I kept thinking I would work on them on my lunch break. I did finish all of them today. I bought a set of 24 of the plastic links and have used them now for 5 balls and have enough left over for two more. I really enjoy this project. This is my mammoth sunflower plant. It grows noticabilly everyday. I am so happy we have a small garden going; tomatoes, jalapenos, lettuce, basil, cucumbers and yellow squash and a few flowers. 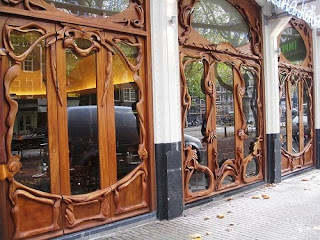 I would love to know what type of wood the doors are carved out of. I have actually seen these in person in Amsterdam. The print is by Jesse M. ?, if you know please let me know. 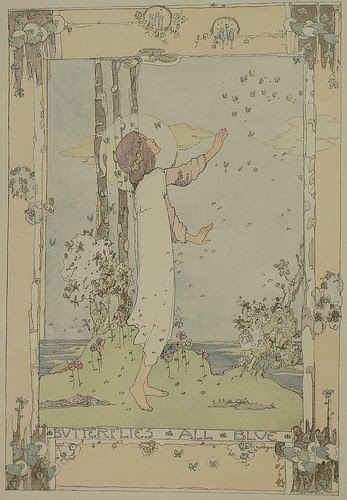 "The butterflies are all blue". Such a beautiful image.